Sioux Falls City Hall is located at 224 West Ninth Street, Sioux Falls, SD 57117; phone: 605-367-8080. Photo: Edward Croughran House, ca. 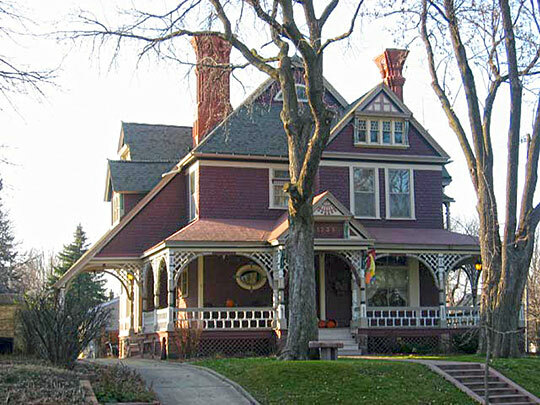 1887, 1203 South 1st Avenue, Sioux Falls, SD. Listed on the National Register of Historic Places in 1979. Photographed by User:AlexiusHoratius (own work), 2009, [cc-by-3.0 (creativecommons.org/licenses/by/3.0)], via Wikimedia Commons, accessed July, 2013. Sioux Falls was named for the falls of the Big Sioux River, is the largest city in South Dakota and the most important industrial and distributing center in the State. The natural beauty of the site upon which Sioux Falls is built contrasts with the rather monotonous undulating plains of the surrounding country. The river often designated by early-day chroniclers as "The Thick-Wooded River" but called "Wakpa-Ipaktan," the winding river, by the Sioux Indians, meanders in the form of a gigantic "S" through the center of the city. The business section follows the river flats from which the residential districts rise up the gradual slopes to the level of the surrounding plains. On the steep hill to the north is the State Penitentiary, its sturdy red and white stone walls dominating the landscape except for the twin spires of St. Joseph's Cathedral which loom infinitely graceful against the sky to the west. Although a dam built for power purposes has marred the original beauty of the falls, in springtime the swollen river tumbles and roars over a series of cascades. The upheaval of red quartzite in the rock-banked river is picturesque, for the stone has worn smooth and taken on orange, pink and purple hues to contrast with the blue-green river and its white foam. The unusual coloring of the quartzite gives the town an individuality, for practically the whole of the city is under-laid by great deposits of this durable building material which outcrops in many places within the city limits; a number of business buildings, government edifices, churches, schools and residences are constructed of this stone. Sioux Falls resembles a century-old Eastern city more than one of Western flavor so commonly associated with South Dakota the great trees that shade residential streets, the stately colleges, the numerous churches, the well-kept parks, and the attractive lawns and gardens. The fertility of the surrounding prairie is the main reason for the existence and rapid growth of Sioux Falls. Products of the soil are manufactured and livestock processed; in turn the city has become a trading center for a large area and a distributing point. Trucks and freight trains make a steady trek to huge warehouses, stockyards and manufacturing concerns. This commerce is the life of the town, and Sioux Falls is called the clearing house of a prairie state. The history of the white man in this region begins when Jean Nicollet was sent by the Government of Canada in 1839 to treat with several tribes of Indians. He published a sketch of his travels in the Northwest, wherein he gave a description of the falls of the Big Sioux River. A copy of this sketch found its way into the hands of Dr. George M. Staples of Dubuque, Iowa, who was so impressed by the natural advantages of the location that in 1865 he organized the Western Town Company of Dubuque, which the same year sent a party to take up land near the falls for a town site. They followed the east bank of the river from Sioux City and took undisturbed possession of the location. A legend that a band of Indians forced the white men to retrace their steps just as they came to the point on Penitentiary Hill where the falls are visible has been proved erroneous. Speculation in lands and town sites was at high pitch and in the winter of 1856-1857 the Dakota Land Company was chartered by an act of the Legislature of Minnesota Territory. The same act established the city of Sioux Falls. Representatives of this company also occupied land in the vicinity of the falls, and erected a log house, naming their settlement Sioux Falls City. The population of Sioux Falls numbered at that time five persons, and although they were representatives of rival companies, they lived together in peace and harmony, fearing only their common enemy, the Sioux. They were not troubled, however, until late in July, when the Indians threatened the extermination of all the settlements on the Big Sioux River. The new settlers discreetly withdrew, leaving the Sioux Valley once more deserted by white men, but not for long. On August 27, 1857, a party of men sent by the Western Town Company arrived in Sioux Falls after a ten days trip from Sioux City. They brought by ox-team machinery for a sawmill and a large stock of provisions. The sawmill was built, and also a stone house and a store. Several of the party then went back to Sioux City, leaving only six men in the settlement until the middle of October, when the Dakota Land Company sent seven men to look after their interests in the settlement. The settlers passed a fairly comfortable winter in three new dwelling houses. During the spring of 1858 a number of other settlers came, some taking land in the upper part of the Sioux Valley, among them the first white woman who came to the Territory to settle, a Mrs. Goodwin, who came early in May with her husband. In 1858 hostile Indians found the thirty-five settlers well fortified and left without molesting them. The white men did not know, however, that the enemy had gone, and remained close within their sod fort until they almost starved to death. The initiative and the determination of the settlers is well shown by the two outstanding happenings of the year 1858. First, there was the acquisition of an old Smith printing press from St. Paul, Minnesota, a veteran machine that had seen long service and had already a colorful past of perilous travels through the wilderness, having come from Dubuque, Iowa, to Lancaster, Wisconsin, before being hauled to St. Paul. On July 2, 1859, The Democrat, the first Sioux Falls newspaper, appeared. Secondly, there were the proceedings that took place in September 1858, when the 30 or 40 persons who made up the population held in a most original manner an election to select members of a Territorial Legislature. The situation of the settlers was a peculiar one, with the admission of Minnesota as a State, since that part of the present Dakotas lying east of the Missouri and the White River had no legal name or existence. On the morning of the election, the whole population divided into parties of three or four, appointed each other judges and clerks of election and then started out with their teams in whatever direction pleased their fancy. Every few miles they rested their horses and established an election precinct on that spot. With all the dignity that the occasion deserved, the members of the party cast their votes, and being determined to succeed in their high ambition to impress the Federal authorities with their numbers, they thought it only fair to cast also the votes of all their relatives and friends, being convinced that these absent ones, if they knew of the high purpose of the actual voters, would without doubt be favorable to the plan. The total balloting reached the hundreds; and soon afterward the Legislature convened and a Governor and a speaker were chosen. In April 1862, Company A., Dakota Cavalry, was organized and a detachment stationed at the Falls. In August an Indian uprising occurred. On the 25th Judge J. B. Amidon and his son were killed about a mile north of Sioux Falls while making hay. A party of Indians appeared on the bluffs northwest of the falls the next day but did not attack. The settlers were alarmed and when two days later some messengers brought news of massacres on the frontier in Minnesota, and also orders from the Governor for the soldiers to proceed to Yankton and bring the settlers with them, the village was abandoned. The Indians then destroyed everything, setting fire to the buildings and throwing the old Smith press into the river. They carried the type away with them, however, and used the bits of metal for making inlaid decorations on the pipes carved from the celebrated pipe-stone, sung by Longfellow. Pieces of the old press were retrieved years later and are now in the Pettigrew Museum. A monument on the Sioux Falls College Campus marks the still visible ruts of the old trail that the fugitives followed to Yankton. For nearly three years the Sioux Valley remained almost deserted. On May 1, 1865, a military post, Fort Dakota, was established in rambling log and stone barracks built on what is now Phillips Ave., between Seventh and Eighth Streets, and occupied by a company of soldiers on a military reservation five miles square, including the present site of the city. The sutler's store at the fort was the forerunner of the mercantile establishments of Sioux Falls. Gradually the settlers returned, newcomers from the East joined them, and the town was established. In 1868 Minnehaha County was reorganized and the next year the hamlet of Sioux Falls had again reached a population equal to that of eleven years before. In 1870 the military reservation was vacated and the land preempted by settlers and for the next three years the development of the valley stimulated the growth of the town, until in the fall of 1873 a census showed 593 inhabitants.